2 Hair style hanging long at the back and a bun at the top. 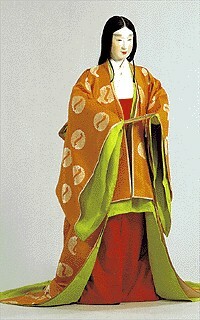 Highest level of formal dress for the empress during the early Heian period. The style originates from the Nara period. It seems to appear in a picture scroll related annual events and to the Murasaki Shikibu diaries. Imperial court wife (Empress?) costume in the tsutsuginu style, with karaginu and mo. It is thought that this style of costume dates from the second half of the 10th century. At the end of the 12th century, the second half of the Heian period, is when it became as we know it now. From the Toba period, the cloister government age, during Shirakawa reign. During that period it was the most wonderful outfit. Even if the marriage ceremony require the best clothes, also in the Imperial Court, the ceremony itself during the Heian period was not a public but private affair. During the Heian period there was no Shinto wedding ceremony. (This changed during the Meiji period when the wedding of the future Emperor Taisho, the then prince Yoshihito, was held the ceremony in front of a Imperial ancestor´s shrine, and it became costum for the normal population as well.) The ceremony was held in-house. The style of costume in the pictures dates from 12th century. Court lady in semiformal costumes known as "itsutsu-ginu ko-uchiki"
The Imperial Court's wife's fundamental full dress is wearing "karaginu" and "mo. However, instead of wearing the full dress, the nobles wore "ko-uchiki" in piles on the "hitoe" and "itsutsu-ginu". "Kouchiki" of modern times of Japan is the same type as "uchiki. Modern "kouchiki" is a dress made by the "mie" cut which attached "betsuretsu" called "nakabe" between the outer material and lining cloth. 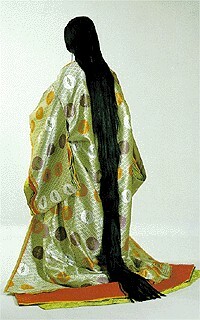 Nontheless, "kouchiki of the last period in Heian era was considered that its dress length was somewhat short. 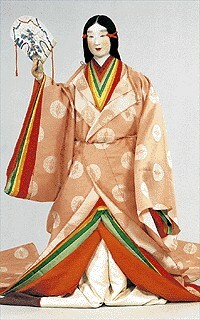 The composite figure in the photo shows "itsutsu-ginu kouchiki," the semiformal costume for court ladies. 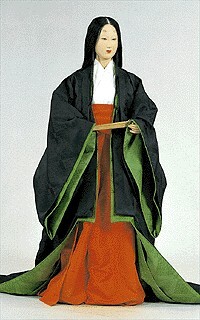 This is a composite figure of a court lady in everyday wear. "Uchiki (=robe)" is worn over "hitoe." A red "hakama" is worn and a white "kosode" is worn under "hitoe." This dress is for winter season. "uchiki" is "nibaiori." "hitoe" is "kartaji-aya" patterned with "saiwaibishi-mon." The"uchiki" was sometimes worn in layers. The court lady holds "akome oogi (=fan)" in her hand. The hair style is straight long hair. Beside the cheeks, she has a pair of short hair called "binsogi" which is the mark of married or an engagement. 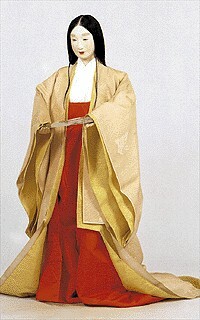 The photo shows a composite figure of a court lady in everyday wear. "Uchiki (=robe)" is worn over "hitoe." A red "hakama" is worn and a white "kosode" is worn under "hitoe." This "uchiki" for summer season is made of "kenmonshaji" (=dress material). " At the time of intense heat in summer, only a piece of "hitoe" might be worn, or some pieces might be worn in layers without "uchiki." The court lady's everyday wear is a combination of "uchiki", "hitoe" and "hakama." "Masasuke Shouzoku Shou "(=a costume collection )" edited at the Insei period writes; "From June, the court ladies wear " hitoe-gasane," light red and light blue in color ... " and it also writes; "The court ladies change their dresses on July 7 ...," and "The court ladies wear "hineri-gasane" from August 1 till 15 ..." Two pieces of "hitoe" make the "hitoe-gasane" style. In the same way, three pieces of it make the"hineri-gasane" style. The costumes of Hojo Masako (1157-1225), the wife of Minamoto no Yoritomo, the founder of Kamakura Shogunate, are kept in the Tsuruokahachiman Shrine. They are three kinds of "hineri-gasane" and a piece of "Hitoe." Kenshunmonin Chunagon Diary has described about the combination of three pieces of "hitoe." It is considered to be a court lady's everyday wear. August is in September of the solar calendar. Therefore, it is autumn. June is in July of the solar calendar. Therefore, since it was in the midst of summer, "hitoe" was made into the array of everyday wear in piles at two sheets. This photograph shows "hitoe-kasane" of summer. The material is raw silk. The pattern "fusen-aya" could be used, but the composite figure is wearing "hitoe" with the pattern of "saiwai-bishi mon" which is indigo blue in color. 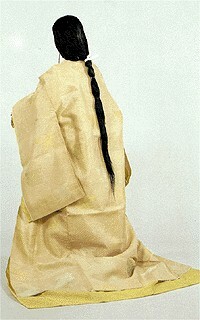 The undergarment is called "kakitsubata-gasane (iris suit)" which is yellowish green in color. The figure is also wearing "kosode (=undergarment, literally short sleeve)" and red "naga-bakama." It is a court dress of the adult age woman who is equivalent to a boy's full court dress, and is the full dress of the Imperial Court. it is also called a karaginumo. It is thought that such a figure was materialized in the middle of the Heian period in the second half of the tenth century. Although the style has changed from the original somewhat, the tradition is continued for a long time, and it is used as a dress of the special ceremony of the Imperial Court today also. At the special time of a ceremony, the hair is arranged to the top of the head and is decorated with a comb. 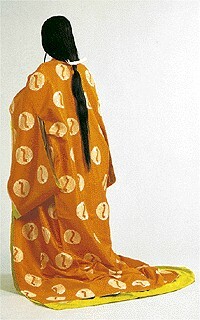 The costume is based on the complete set of itsutsuginu (5 layers), uchiki robe, long hakama trousers and karaginu and mo. The mo is handpainted with various motifs like a pine, a plum, and a mandarin orange tree. This is a young woman´s holiday costume and small over-robe with lenghts of silk without starch. 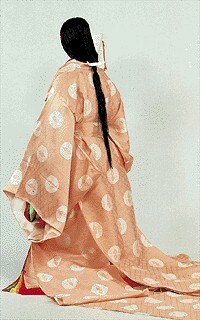 The kosode, short sleeved kimono, is now eing used in several layers, becoming the basis of the kimono as we know it now. During this period the amount of layers was being reduced to 3 (instead of the 5 in tsutsuginu style) and the use of kosode, short sleeved kimono, to create they layered efect which can be seen at the collar. This combination makes use of 3 kosode, 2 in white and 1 in red, to create layers, and the outer kinu robes, which are 3. 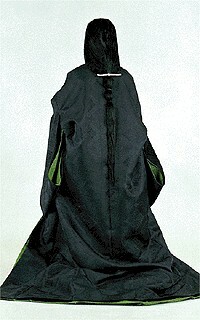 The special unstarched silk split end robe is placed on top and is held with a small obi belt. The kosode is the original under-robe that will become what we now know as the kimono. During the 15th and 16th century it will become the focus of the samurai class and later merchant class to demonstrate power and money. Young daughter of the noble family in formal dress called "kazami"
"Kazami" is a formal dress for the daughter of noble family, and was originally designed as inner clothes ( underwear) to soak up sweat. Eventually it became an outer dress for the people in lower social class. It was made larger to be used for the full dress of the youong daughters of the imperial court. Therefore, naturally the original form of "kazami" must be quite different from the one worn by the young daughters of the imperial court, but then both of them are "hitoe," unlined kimono clothes after all. 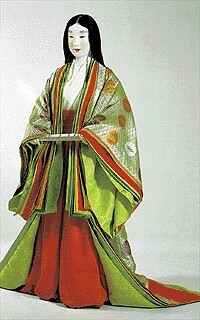 The features of full dress of young daughter of imperial court are, a round-shaped neckband, "ketteki" (=outer kimono clothes with open armholes), 2 kins of body width, and 2 kins of sleeve width, 1 jo 6 shaku of front part kimono length (=dresser's length) and 1 jo 5 shaku of back part kimono. The figure in the photo is dressed in a square form with the neckband desined in a round shape. Under the "kazami" it wears "akome", "itsutsu-ginu (=five clothes)," "uchiki (=middle garment)," "hitoe (=unlined garment)", a white omote-bakama (=divided skirt), all of which are layered up on long "hari-bakama ." They are all based on the sizes shown in the Masasuke Shouzoku (=costume) Selection"